We’ve been getting out quite a bit lately. Two weeks ago we raced down to Slemish for a quick overnighter after work and were met with a wonderful sunset for the evening. Oisin wrote up a trip report here. The weekend before that we had a two day camp at Millstone and Tollymore, where we took in the Newcastle Festival of Flight. Check out the video here. A month ago we headed to Dungonnell where we spent the evening with beautiful views of the Glenariff. Six weeks back we spent two nights of camping at Garron Point above the abandoned village of Galboly and the historic Sallagh Braes. You can check out Oisin’s trip report for Garron Point here or check out the video from the weekend here. So why stop when you’re on a roll? Last weekend we decided on a two day trip starting at Fofanny Dam. While James, Dave and I had the day off work, Oisin didn’t, so we settled on somewhere quick and easy to reach from the road, as he would be arriving after dark. A stormy weekend was forecast and winds were already quite high, so on arrival everyone set up their tents inside the wood. I had brought the Vango Nemesis 200, a geodesic tent designed to be stable in wind, so opted for the more exposed flat ground outside the forest. We lit up a firelog and relaxed in the forest under a tarp while the rain lashed down and the wind howled. Oisin arrived just before dark and we were glad to have chosen an accessible spot, for it meant he was there to enjoy the craic that much sooner. 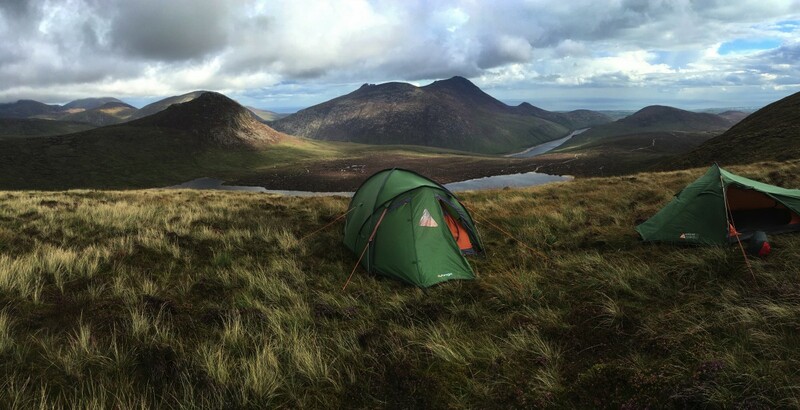 After a night of great craic by the fire and a few glasses of port, it was time to head back to our tents for the night. I had been peering over towards my tent a few times during the night and was impressed at how solid it looked in the wind. 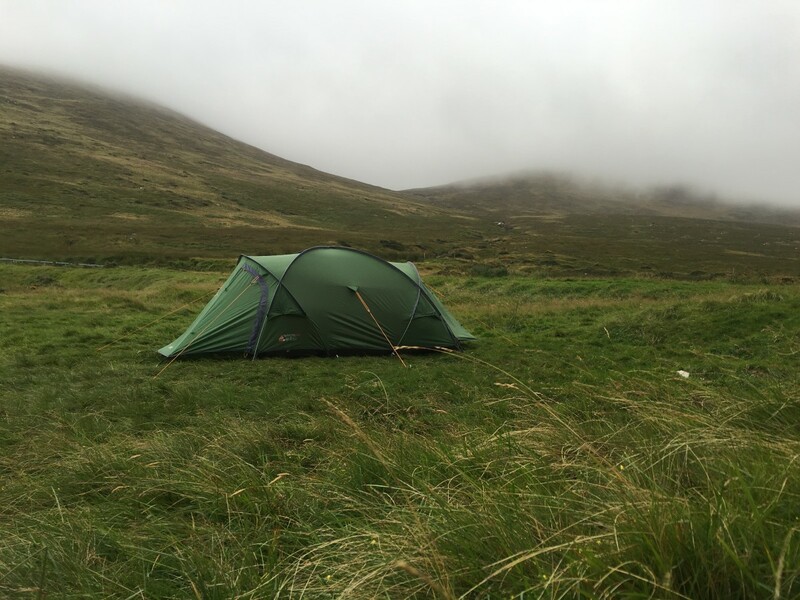 A thick, damp fog was blowing through camp and I was glad to have a sturdy shelter waiting for me. Dawn came with more grey and rain. 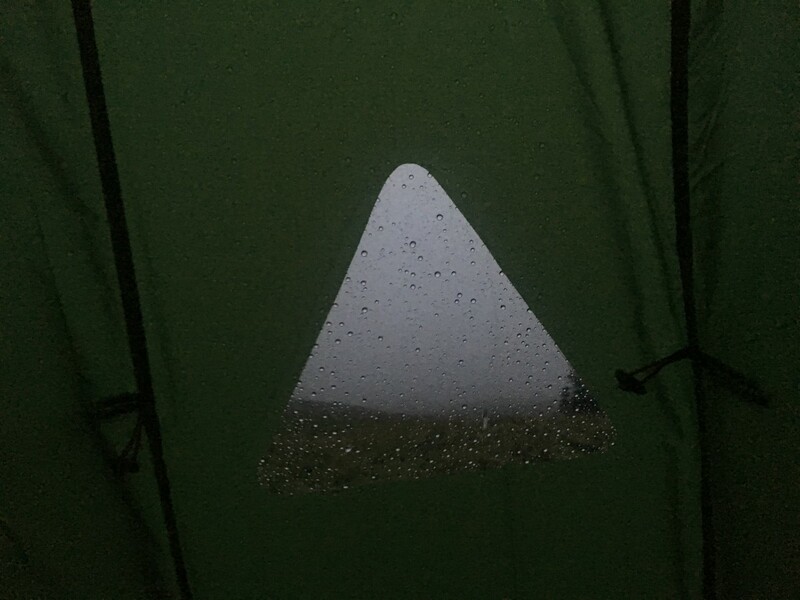 Hearing the rain beat off my tent, as it had done all night made me all the more glad I hadn’t decided to bring my bivi bag for the weekend. 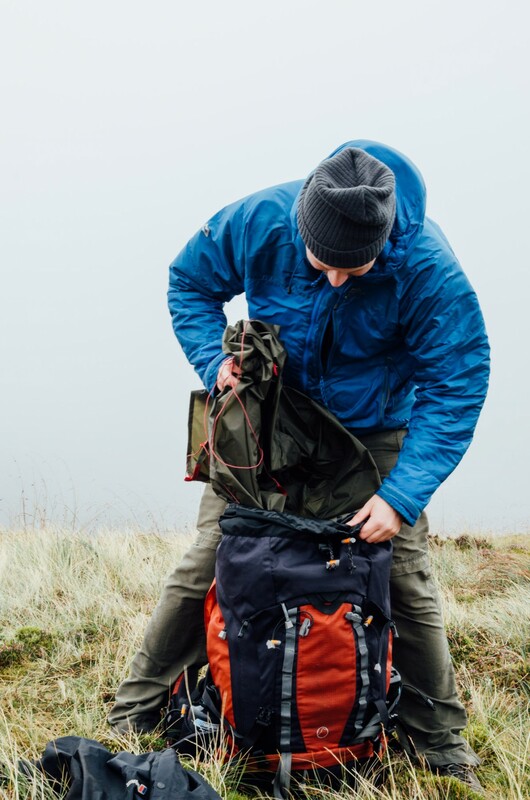 I know from experience at some previous camps that 8+ hours of rain hitting a fabric which is in contact with your face – isn’t the most comfortable experience. Compared to my bivi the Nemesis 200 was absolutely palatial. For one person it’s probably too much, but I wasn’t complaining. My hopes of some wonderful sunrise photography dashed by the weather, I decided to boil up a coffee and relax for another couple of hours. My hope was that the weather would lift somewhat and I might get a chance to pack my tent away semi-dry. The Nemesis 200 is a big, heavy tent and all that fabric is definitely noticeably heavier when wet. Patience paid off and the rain relented. The wind dropped considerably too. I packed my tent away slightly damp, but I was glad I hadn’t packed it completely sodden at the break of dawn. The wind had died just enough for us all to get feasted on by midge as we left. Good thing we didn’t leave it any later! 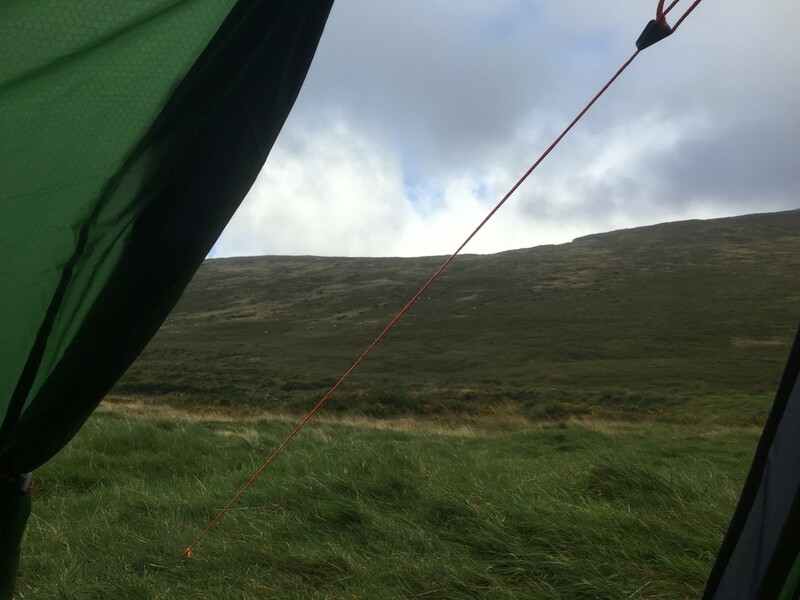 Day Two – Carn camp with a view! The weather was typically changeable with clouds rolling past almost constantly. The others had headed home, but Oisin and I had decided to camp on either Carn or Loughshannagh, whichever gave us the best view. The walk up was wet and boggy from all the rain which had lashed down the day before and a couple of mis-steps had given us both quite wet, muddy feet. When we reached the stile at the Loughshannagh / Carn col we decided to turn right and head up Carn, which looked like it would have the better view. We stopped half way up at roughly the 550m mark, where we had a spectacular view and good flat ground for our tents. We wasted no time getting set up during the break in the rain and with such a breathtaking view we knew we had found the perfect spot for night two! Scroll around to see the view! With our tents pitched we took some time to get photos and cooked up some supper. The Nemesis 200’s large porches definitely made things more comfortable. On a longer hike I might have cursed the pack weight, but on this trip the comfort was more than worth the weight. With one porch sealed shut and facing the wind, we rolled up the door on the opposite porch and enjoyed the view down over Loughshannagh while I boiled some water for our coffee and noodles. 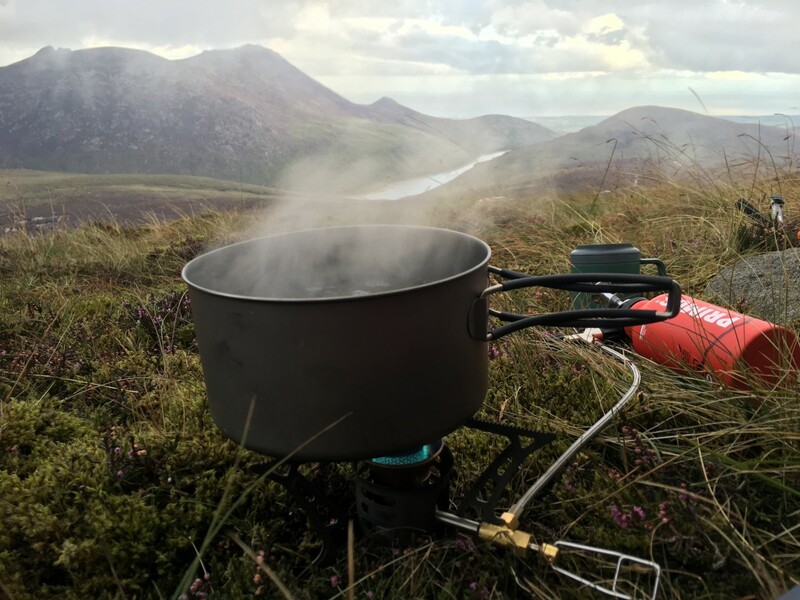 I’d brought the Primus OmniLite Ti to cook on and had fitted the “silencer” which significantly reduces the characteristic “roar” present in all liquid fuel stoves. It did a good job for such a lightweight setup, but I wouldn’t chance using a liquid fuel stove without the porch door fully rolled up. We heard from Eamonn that he was on his way to meet us, just as the weather started to turn again. The rain returned with a vengeance and Eamonn quickly pitched his tent in the rain before joining Oisin and I inside the Nemesis where we sat and enjoyed our evening. It’s nights like this where the extra weight of a large tent are worth it. With small solo tents we’d have had no choice but to either lay out in the rain in our waterproofs, or retire to our individual tents for the evening. With the size of the porches on my tent the three of us were able to sit and relax while the rain beat down outside. 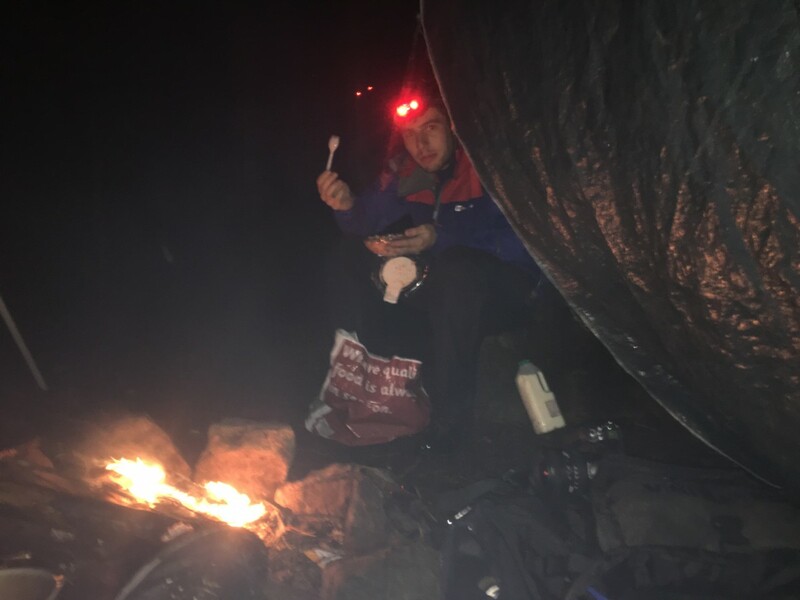 Eamonn brought his little tent lamp, which lit the tent up nicely with a diffused light, certainly more agreeable than the harsh glare of a headtorch. We listened to some music, had a few beers and chatted about past trips and future plans. Once again I felt I had made the right choice to bring a tent for a change. There’s a certain perverse pleasure to be had from lying cocooned in a bivi during a storm, but it’s far from a sociable experience. 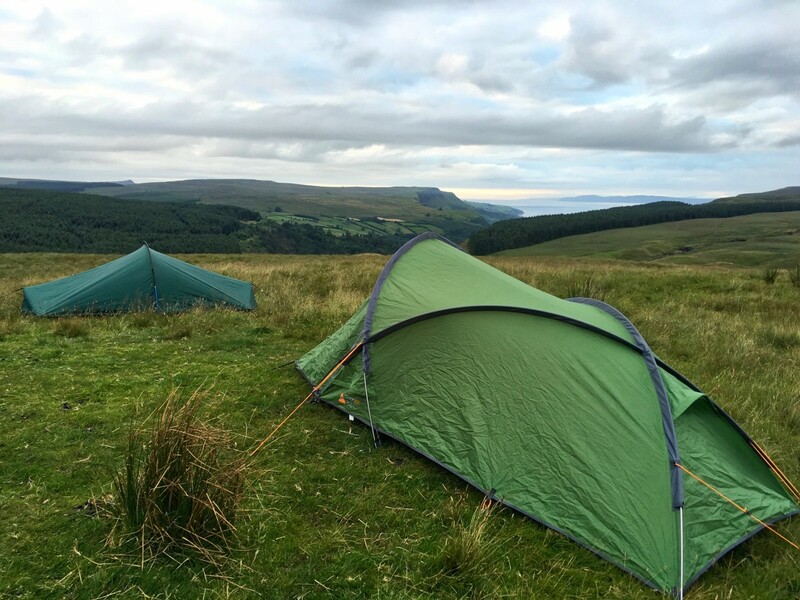 We had a fantastic evening and when the others headed back to their tents for the night, I had a great night’s sleep in a tent which barely shook all night. The next day it was time to head back to civilisation. We passed a large group of hikers heading up the Ott track for their Sunday morning hike, while it was still very cloudy when we set off from camp, by the time we reached the stile at the Col, the clouds cleared in an instant and the sun beamed down on us. It was almost as if the Mournes wanted to taunt us, or tempt us to stay in the sun after two days of rain. Even after having been out for four trips and seven nights of camping in the past six weeks, there was no sense of growing apathetic towards the experience. An amazing two days in the hills left us all feeling refreshed and thankful for the natural beauty we have on our doorstep!